Commercial, packaging or label printing – digitization offers the printing industry many opportunities. Unleash your full potential for greater customer satisfaction, productivity, and profit. And do so with less effort and overtime as well as fewer errors. New processes with the consistent digitization and optimization of the entire workflow are the key to this. Push to Stop becomes a reality. Your print shop becomes a smart print shop. “A printing press is made to print.” In practice, however, only 30 % of its potential is exploited on average*. One reason for this is that the areas upstream of the actual printing process are working at their capacity limit. The crucial factor: these areas account for 55 % of the throughput time of a print job*. The solution to this lies in intelligent machines that organize and process standardized printing processes autonomously. The prerequisite: the harmonious interaction of six key factors. Web portals simplify communication and automate workflows. The result: more efficiency, more customer service, more turnover. Fewer touchpoints and more automation unleash unrealized potential. Throughput increases. Increase productivity and operating time. Efficient planning and automatic data availability increase the operating time and productivity. Profits increase. Reduce paper waste and warehousing. Optimal materials ensure reproducible production. The paper waste decreases. Standardization provides certainty and consistency. Production is more predictable. Business Intelligence delivers sound information. For decision-making based on real facts. Smart Print Shop. Prerequisites and potential. How you can make Push to Stop a reality in your print shop. Which six key factors will help you to increase productivity. How you can reduce complexity and automate processes. How you can produce closer to the maximum performance level. Workflow solutions for Business & Production. through to production, the finished product, and billing. label printing – Prinect is the right solution. You already know: customers expect individual support, tailored to their needs. At any time and immediately. Prinect enables you and your customers to communicate easily online. Offerings, data exchange and production releases with automatic status updates now only take a few clicks. The result: high customer satisfaction and fewer time-consuming and costly manual processes. How about being able to optimize your order receipt and, in so doing, creating an even stronger bond between you and your customers? You do not have to change your customers to do so. With Prinect, not only do you find the suitable price, you also define the optimal end-to-end process automation from the customer to production and delivery. The result: shorter processing times, lower costs, and satisfied customers. Do you not manage to create as many offerings as you would like? With Prinect, you reduce your workload when creating offerings by up to 90 %. If successful, jobs are created in a matter of seconds with automatic process definition. The result: operate more successfully on the market with more offerings and minimal effort to start production. What is your planning worth ten minutes after you have completed it? Constant adjustments are unavoidable and require flexibility. Prinect continuously provides the current status, automated rescheduling and informs all employees. In production and business. Changeover times are minimized by means of an optimal job sequence. The result: less downtime and more salable sheets per hour. Are your presses and postpress machines idle because of missing information or materials? Manual job inputs lead to unnecessary delays. Prinect provides all required data and optimizes workflows. Time-consuming touchpoints are significantly reduced by means of automation. The result: standard tasks are eliminated, reducing the workload of your operators. The effectiveness of your machines is increased. Do you know your potential? And your bottlenecks? Do you have an overview of all sub-areas and see the connections? With Prinect, you have access to production and business data at all times. Evaluations of production data in real time and the identification of trends are no longer a challenge for you. The result: You gain a fresh perspective of your company and make decisions more easily and reliably. Smart processes for commercial, packaging and label printing. Thanks to Prinect APSC, we save on makeready time and paper waste with short runs. Since we started using this software, our quality has become so good that we don't need any backing any more, nor do we need to tension the plate clamping bar. Prinect Automatic Paper Stretch Compensation saves us makeready time and paper waste in at least five jobs every week. We have been using APSC in our company since April 2015. 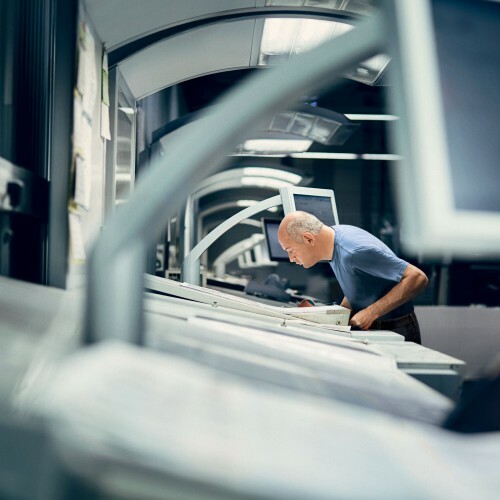 It brings us considerable benefits when working with our Speedmaster XL 106-8P with Autoplate XL and Prinect Inpress Control, which we use exclusively for the production of short and very short runs. In the meantime, we compensate all jobs on 90 gram papers using Prinect APSC software. We’re talking about a total of around 12,000 plates per month.